While plenty of smartwatches and trackers can measure your heart rate, most don’t really have a medical purpose outside of familiarising yourself with a baseline. Even the Apple Watch Series 4 comes with a lot of caveats about its ECG and atrial fibrillation features. 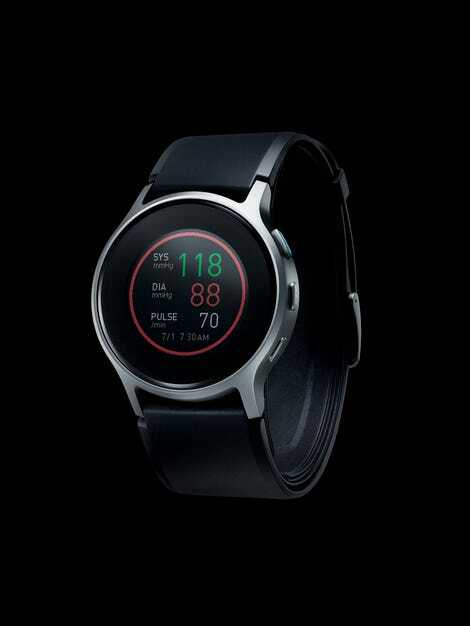 But Omron’s HeartGuide smartwatch is the first wearable to successfully measure blood pressure from the wrist. The technology in the HeartGuide is pretty impressive. Underneath the strap is a cuff that inflates to measure systolic and diastolic pressure via the oscillometric method. Basically, it’s the same technique used at your doctor’s office where they strap and inflate a cuff on your arm, except much smaller. I got to try a demo of the device recently, and I have to say using the HeartGuide is simple, short, and definitely less painful than whatever the nurse does to me at my yearly physicals—it even seemed to match the results I normally get! To test you just press a button, hold your hand over your heart, and the cuff automatically inflates and deflates on its own. When it’s done, you can see a reading of your blood pressure on the screen. If it’s in a healthy range, you’ll see a green circle. If your blood pressure is too high, the border will turn red. The only thing I found slightly difficult in the demo was fit. My wrists are on the smaller side, so it was hard to get a proper fit with a medium-sized unit. Omron says the medium should fit about 75 per cent of users, and that small and large versions will eventually be released for the rest of us. Omron’s main business has always been blood pressure testing devices, but designing one intended to be worn all of the time presented some challenges. First off, the strap itself has to be inflexible and any pumps inside have to press air directly downward or you risk inaccurate measurements. Also, miniaturising the oscillometric method to fit on a wrist required Omron to file more than 80 patents, and CEO Randy Kellogg claimed to me that some of the proprietary pumps, valves, and chips in the device are smaller than a grain of rice. All those things considered, the estimated battery life on the HeartGuide is surprisingly long. Omron gave me a conservative two-day estimate, but said you should be able to get 30-50 inflations from a single charge. Ultimately, Omron said that should translate to charging about 1-2 times per week. Helping that is the HeartGuide’s transflective screen. While it’s capable of colour and should be easy to read in direct sunlight, it won’t be quite as bright as the OLED or AMOLED screen you typically see in touchscreen smartwatches. Aside from blood pressure, the HeartGuide can also track steps, distance, sleep, and calories burned. It is also expected to handle call, text, and email notifications. And since data without context isn’t particularly helpful, the HeartGuide will come with an app. The plan is for the app to provide insights about your blood pressure in relation to the quality of sleep, your activity levels, and other lifestyle habits like how much coffee you drink. But most impressive is the HeartGuide currently has 510k clearance from the US Food and Drug Administration, which means it should be as accurate as other blood pressure testing device already available. Unlike the 30 days Apple needed for the FDA’s de novo classification, the HeartGuide had to undergo two years of testing and case studies. And that’s what makes it an interesting counterpoint to the Apple Watch Series 4. The Series 4 is not intended to be used by anyone already diagnosed with atrial fibrillation. It’s meant to potentially alert you that you might have Afib. Meanwhile, the HeartGuide is a smartwatch meant to help people who already know they have high blood pressure. “People who buy this watch most likely, have already gone to their doctor and been diagnosed with high blood pressure,” Kellogg told me. Basically, this is a smartwatch that’s actual useful for your parents and grandparents. At $500 (£396; UK pricing and availability TBA), it’s not exactly cheap. But in terms of actual utility, it appears to be a more thoughtful health device than the Apple Watch. Blood pressure is just as much of a silent killer as atrial fibrillation. According to the British Heart Foundation, as many as 7 million adults in the UK have high blood pressure. When you consider blood pressure tends to fluctuate throughout the day, a singular spot reading at the doctor’s office or at the pharmacy doesn’t really paint a holistic picture. Giving high blood pressure patients a way to easily and accurately monitor how their lifestyles impact their readings could be a gamechanger. We’ll know more about how accurate it is and how long that battery life actually lasts when we review it next year. But for right now, the device is available for preorder on Omron’s website. It will officially launch at CES on 8 January.